Our mission at The Roofing Specialists Inc. is to provide our customers with the highest quality of workmanship, materials, and product knowledge available in the roofing industry. We are committed to upholding ourselves to the highest professional standards. We accomplish this goal by offering you, our customer, a wide-range of quality products to meet your needs and budget. We provide you with the tools and knowledge necessary to make an informed decision, and dedicating ourselves to your complete satisfaction throughout all phases of the project, from beginning to completion. 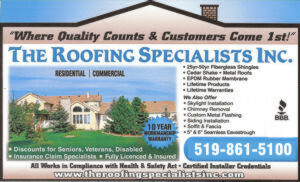 The Roofing Specialists Inc. is a GAF certified installer. We are also a manufacturer selected (GAF) roofing company chosen based on elite workmanship and regional performance.